It's 5 a.m. and today is a John Philip Sousa song of a sunrise. I am driving 17 hours home from Louisiana. As made famous by Elvis Presley, plays on oldies radio. I have promised myself I won't stop to see Graceland. But, boy, don't we white men sing pretty about America. is a stripe on a bleeding flag. I pass what can only be described as amber waves of grain. my image of the flag is always at half mast. it is almost sacrilege for the flag to be entirely raised. As if death is not still the creditor of our discharged debt. anything tethered can hope for. I am driving past Graceland. I will not stop to see it. And I am eager to see your 2nd generation eyes. Everyone I know did in college. As if we aren't all children of the same fabricated Eden? 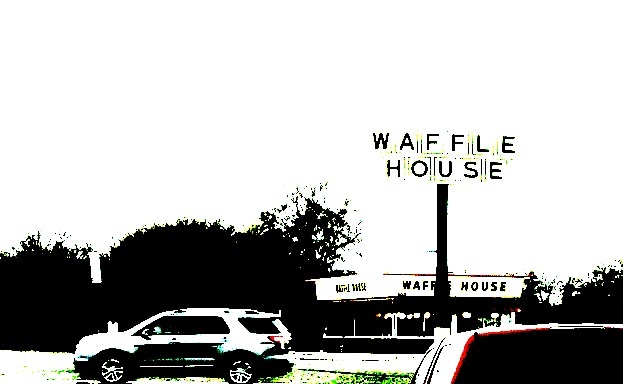 is my favorite Waffle House. As they wink at me like a hitchhiker. Or Chuck Berry or Graceland. at least signify a constant battle against stasis. Home was never just America. as long as I don't have go to work. But either way, I can't wait to be back home soon. Eric S is a member of the Mental Graffiti Team that represented Chicago at the National Poetry Slam in Boston this past August. He is also the author of phylum — a chapbook of poems and ramblings that he has available when performing his poetry. We heard Eric perform this poem live and had to share it with our readers. Eric agreed to share it with us and we share it with you now on the day that America travels most. Wherever home is, Happy Thanksgiving!